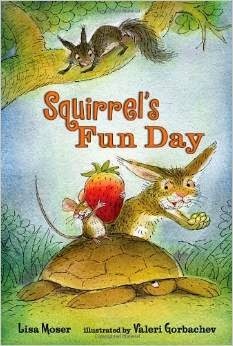 Squirrel's Fun Day by Lisa Moser and Valeri Gorbachev. What's "fun" for one may not be for another. Ever have an exhausting friend? Prepare to laugh-out-loud as Squirrel's unbridled mania is unleashed upon his more mild companions. Gorbachev's lovely, line-y illustrations are always classic and delightful. Recommended by The PlanetEsme Plan. Link for information; please support your local independent bookseller. Gus, the Dinosaur Bus by Julia Liu and Bei Lynn. 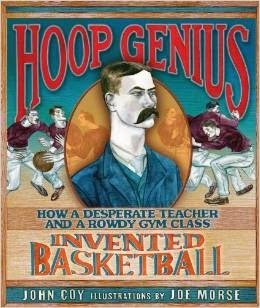 A story and loose illustration style harkening back to old-school favorites, sure to find new fans. Worth it just to see a dinosaur cause a traffic jam. Recommended by The PlanetEsme Plan. Link for information; please support your local independent bookseller. 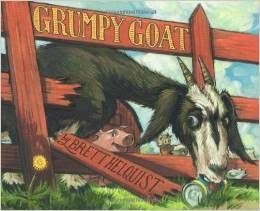 Grumpy Goat by Brett Helquist. "Goat had never had a single friend in his life. He didn't want one now." That is, until the nurturing of a dandelion rallies the barnyard around him. 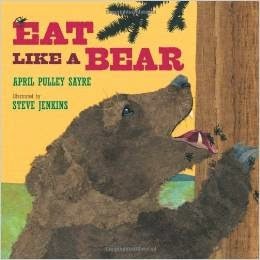 An old-fashioned story of abundance vs. scarcity, and one Roger Duvoisin or maybe The Little Prince would be proud of. Recommended by The PlanetEsme Plan. Link for information, please support your local independent bookseller.